Just a quick weekend fun mani today. A friend had invited me to go check out a band last night, and while that fell through on both our parts, I still managed to squeak in time for a flash rock-star paint job. This is not thefirst time i've used a England's flawless Perceval for dramatic nail-art undies, nor will it be the last. 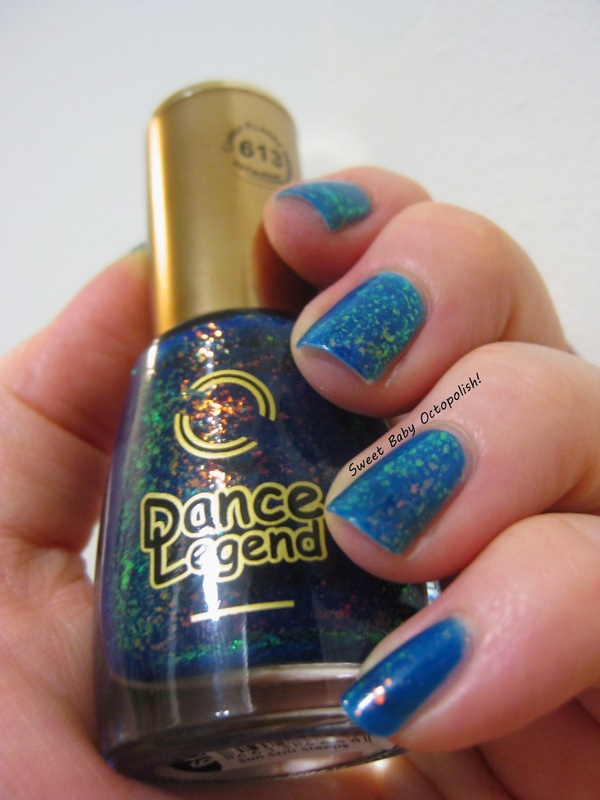 I swear, this one has got to be one of my "desert island" polishes (not that nail polish would be the first survival essential one would plan for, ahem). 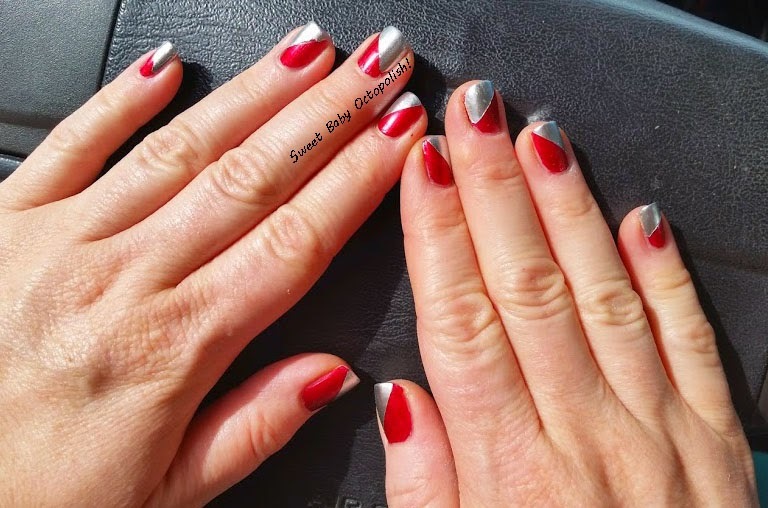 I used some plain ol' scotch tape to stick on some diagonal stripes from ~1/3 down one side of my nail to the opposite tip corner, then layered on Sally Hansen's Sterling Silver Color Foil. Australian maker Femme Fatale's Fallen Kingdom is a cool-toned autumn in a bottle: rose and chocolate and old gold instead of firey reds and oranges. The base starts off sheer, but is quickly buildable, opaque in 2 dabbed coats. It's a deep taupe-chocolate, with some very fine gold shimmer that's hidden by the glitters in low light, but adds a lush sparkle in brighter lighting. The lumpy look does drive me a little crazy (heavily textured polishes so not my thing), but the color combination is so pretty. This past weekend, I was shopping with a girlfriend when we came across a jumbled bin of nail polishes at a TJ Maxx. The pile had some of Essie's winter collection from last year, a random assortment of Juleps, an OPI Muppets glitter and an oldie from the 2011 Texas collection, and WHAAAA? OPI doesn't put out a whole bunch of holos, and I think most of us nail polish crazies could spot all of them on sight. Never heard of Blue Chips, but the fantastic color and less than $4 price tag made this a no-brainer buy. Of every Takkito I've seen, Opium was the one that was undeniably a must-have... and ultimately, the one that taught me that "batch differences" in indie polishes may totally be a real thing. Suzy wore this one recently, and it looked amazing on her: rich, deep brown, full of fire. Since I had a meeting that really needed some Srs Bzns, it was totally time to try this one out again. Opium, on me, is never brown, in any light; it's always black. Maybe that's my super pale skin making it look even darker, or maybe I have a different batch, but there ya go. In the right light, it does indeed have an incredible shimmer of the red-to-green Clarins 230/Fantasy Fire sort, just not quite as much as in the bottle. At times, it looks like glowy embers from within that inky black, and it's really pretty when the right light + right angle strike red and gold and bronze sparks. The boy declared aqua to be the next color, and then selected OPI's Austin-tatious Turquoise from a lineup. This happened to be the only one I scooped up from the 2011 Texas collection, and I hadn't worn it again since I became a full-bore polish junkie, so it was due for another test drive. Austin is a bright blue-leaning teal, packed with glass-fleck shimmer that often gave it a metallic or foil sort of look. Fantastic in the sunlight and still eye catching indoor, the color is just killer. With some sun, it's pearl-y, metallic-y, and in low light, the glass flecks look almost like foil or micro-flakes. Yes indeedy, at angles, there's a little lavender flash in Austin. Llarowe has been putting out some really big seasonal collections lately, meaning there's usually one or two I have my eye on. My pick from the Spring 2014 batch was Look at Me I'm Sandra Dee. Sandra Dee is a scattering of rose glitter (impossible for me to finally decide if it was deep pink or light red) in slightly finer silver holo glitter. The overall result is a pink tinged silver holo, with a chunky rainbow rather than a smooth linear arc. In most lighting, there was at least a hint of rainbow sparkle, but the further away from bright sunlight I got, this tilted toward being a shimmery silver with lots of little reddish flecks (scientist mind immediately thought of bacterial colonies or tiny mites. awesome.) that did impart some texture to the overall finish. When the holo was most in effect, the red dots blended interestingly into the rest of the sparkle and really added something unique to a silver glitter holo look. Sometimes, with a stash of a bajillionty polishes, one manages to not get around to something purchased until loooooong after it shows up at one's house. And clearly, by "one," i mean me. Anyway, after Cult Nails had a sale, oh, last year I think, I picked up Enigmatic to try the brand out. Cult used to maintain a "vault" section on their website, but I don't currently find it. The original description for Enigmatic said it was "sheer but buildable," and I'd certainly agree with that. The first coat is a very sheer charcoal, quite similar to the base the Picture Polish space collection has. 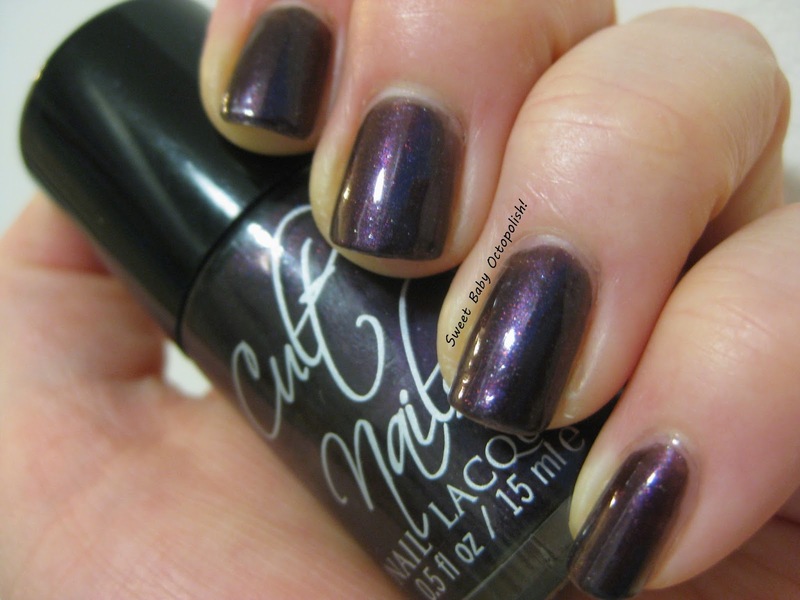 With 2-3 coats, the plum-wine shimmer builds up to visible opacity. This above pic is how Enigmatic looked on me most of the time: in most indoor lighting, it's an earthy off-black, somewhere between purple and brown/taupe, glossy jelly with very subtle shimmer. Though the first swatches of the blue one looked to be just blue, after being totally in love with the other DL candy flake polishes I tried, I snagged this one, too (the hot pink and the neon orange are just not my thing, so no complete collection here). Sun Still Sleeps is most assuredly not just blue-on-blue. S3 is a vibrant, summery, swimming-pool blue that's packed with rainbow flakies. Wonderfully, all the color you see in the bottle translates well to the nail, and with a flick of the fingers, the flakies would shift everywhere from deep red to metallic gold-green. Like the others in the candy flakes collection, it's a jelly base that needs a few coats to get close to opacity. You could layer over a matching opaque crème if VNL bugs you, but in this case, I think the jelly sheerness adds to the tropical water effect. I'm wearing 3 coats in all the pics here, and I found it to only be less than opaque with light shining through it. My first go-round with CrowsToes Pleiades collection was the swoon-worthy Merope, and her sister Maia is just as lovely. Like Merope, Maia is a sheer base packed with color-shifting shimmer. The first coat showed a translucent charcoal base very reminiscent of the Dance Legend duochromes, but the second coat had things mostly opaque. I added a 3rd coat to any lighter patches (mostly over my tips), and that did the trick. Maia is a deep rosy wine in direct light that easily shifts to a coppery bronze at any angle of the light. It's additionally packed with microflakes that also shift color, so that in low light they look like peppery silvered spots, and in bright light like glass fleck shimmer. The pink-to-bronze shift goes through plenty of rich, warm shades of red and gold in-between: it's totally autumn in a bottle.